Greetings from Vajragoni here at Unborn Mind Zen! It seems hard to fathom yet another Blog season has come to its conclusion. We began our season back in August and the most recent series was Unborn Light Reiki, one that was originally published in 2004 and highlights a new Reiki Modality incorporating principles from Unborn Mind Zen. It was initiated just after a series entitled, Vasubandhu and the Absolute—a lengthy study on the Madhyāntavibhāgabhāṣya+ṭīkā, incorporating the scholarship of Theodor Stcherbatsky and Dutch scholar David Lasar Friedmann, both written back in the mid-1930’s. This Western approach, unlike contemporary Tibetan editions, offers a greater emphasis on the “world-view” of the original compilers, like Vasubandhu. In February we offered a series on The Zen Teaching of Instantaneous Awakening by Dazhu Huihai. In keeping with the convention found in blogs here at Unborn Mind Zen, this version of his work was written in the Light and Spirit of the Unborn and its Lankavatarian groundwork. Ours is a Living Tradition, and what is offered here represents an authentic and vibrant spirituality that has been formed and cultivated through many years of study, contemplation, and disciplined dhyana resulting in a Noble Self-realization that the Great Unborn Spirit alone can bestow. In January we ventured upon a study of Dr. Peter Masefield’s groundbreaking masterpiece, Divine Revelation in Pali Buddhism—Divine Revelation. Masefield contends that his study is a revaluation and a remythologization of what mainstream academia shuns and holds as anathema to their rigid methodologies. December presented A Docetic Assessment—a “Docetic Buddhology” that clearly articulates how the apparent physical properties of a Tathāgata are inherently deceptive. Buddhas are thus not some psychophysical beings conceived and born from a defiled womb, but instead emanate from a Noble Womb (Tathāgata-garbha) and hence are wholly spiritual in essence. This realization radiates a most profound soteriological import in that all former karmic associations and attachments are rendered void once one “Puts-on the Unborn Buddha Mind” and no longer makes any further provisions for the flesh. November focused on the Anūnatvāpūrṇatvanirdeśaparivarta, one of the Tathāgata-garbha Scriptures; a short Mahayana Sūtra that is extant only in a Chinese translation. Its value is worth its weight in dragon pearls as even the great Ratnagotravibhāga utilizes it as a proof text, quoting roughly half of the Sūtra. Generally, it expounds upon the unitary nature of the tathāgatagarbha, Dharmakāya, and the sattvadhātu. In October we began a most enjoyable series on the teachings of the Zennist entitled, Ekacitta: Advanced Studies in Dark Zen. The Zennist’s long familiarity and vivacious acumen within the field of Zen Mysticism is vastly underrated when compared to more Western materialistically bent and spiritually-myopic (purportedly Buddhist) “celebrities” whose focus is exclusively upon psychophysical components at the expense of the Transcendent. For the Zennist, one who considers any aspect of Buddhism must be open to the eventual attainment of “gnosis, or super-intuition”; The Zennist always emphatically states that the adept must “transcendentally detach” from one’s embodied existence. Without this detachment, then one is imprisoned within the body and fails to “precede” it with the “Light of Mahayana”. In line with this, zen meditation need not exclusively and incessantly focus on “sitting”, but rather be more concerned with the inner-quest that will bypass the psychophysical mechanism altogether empowering one to be more robustly attuned with those primordial energies that are at the apex of awakening. 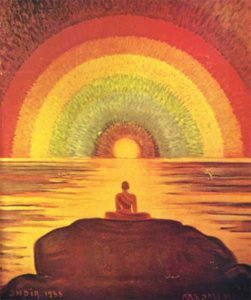 September launched a most singular series entitled, Beyond the Rainbow Body; it’s focus is not so much on the particular phenomenon known as the Rainbow Body, but the very fact that they are just that—phenomenalizations. The series presented alternative meditation settings of entering into the “other side” of those phenomenal-temporal manifestations, utilizing the theme of spiritual-darkness to a great extent. When our season opened in August, we engaged a series entitled, Ḍākiṇī: Dark Mistress of the Unborn. In terms of the Ḍākiṇī’s alliance with the Unborn, she quintessentially represents the inner and outer currents of the Dark Principle THAT freely animates all dharmata and returns it to the Mahasunya from which it sprang. The series concluded with a singular-spiritual-exercise, Yoga of the Manomayakāya. This Mind-Meditation nicely illustrates the inner-workings of the Dark Principle as activated by the Manomayakāya through the mindship of the Ḍākiṇī. The season initially commenced with a bodhifilm called, Terma: A Mind Film by Vajragoni. The short film production depicts the spiritual-practice of Terma, or the discovery of hidden Bodhi-treasures. Most of the action appears in an ancient cemetery, chosen to highlight the spiritual ambiance of Chöd, meaning cutting-through all the barriers to Self-Realization as well as empowering the yogin to sustain a primordial appearance that is free from all fear. The young woman in the film is Tarynia, representative of a Ḍākiṇī—in this instance the bearer and revealer of the spiritual treasures (Dharma-Tools) that are blessed by the Yogin-Bodhi Shaman. As always, it is essential for me in terms of healthy holistic growth to wisely choose some time apart for recharging my spiritual vitality. So I am once again looking forward now to that good quality time spent apart for extra dharma-study and meditation in deep samadhis. Until next time, be safe and well and Happy Reading! This entry was posted in Spirituality, Uncategorized and tagged Ḍākiṇī, Rainbow Body, Terma, Yoga of the Manomayakāya. Bookmark the permalink.